Standing: IITA Goodwill Ambassador, former president Olusegun Obasanjo, addressing the audience during the NZHF in Benue. The peer advisory mechanism is a brainchild of the Nigeria Zero Hunger Forum (NZHF) that aims at reviewing, monitoring, and advising states in Nigeria on the ways and means by which the states themselves, using available resources, can achieve zero hunger by 2025. The five pilot states which have given their endorsement include Benue, Borno, Ebonyi, Ogun, and Sokoto. 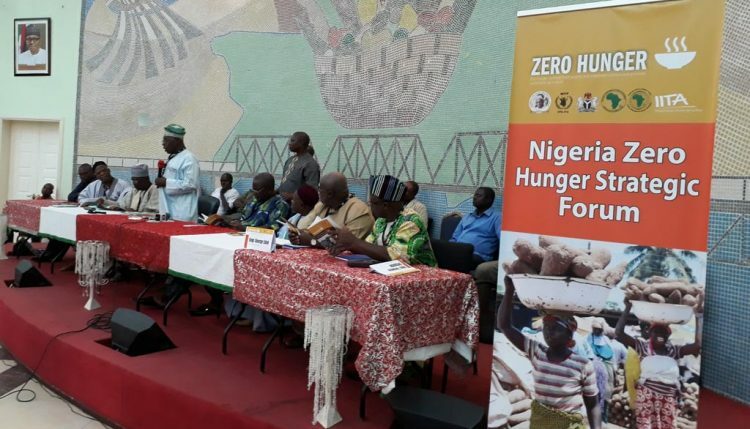 “More states will be involved as we make progress,” according to IITA Goodwill Ambassador, former President Olusegun Obasanjo, who is chairing the NZHF. Members of the NZHF, which cut across the private sector, government and development partners, agreed on a unified structure to enable the Forum to achieve its goals. To facilitate the implementation of its role, the Forum adopted a template for its future advisory meetings: The first day should be dedicated to a welcome address by the state followed by presentations of what is going on in the host State related to achieving zero hunger (challenges, successes, and lessons learned). The next day should be dedicated to field visits to engage with large, medium, and small-scale farmer groups; medium and large-scale agriculture-related industries such as food and feed processors, and fertilizer blending factories, and programs to improve the health and nutrition of infants and children. The day should end with a reflection and a communiqué. Kenton Dashiell, IITA Deputy Director General, Partnerships for Delivery, who also manages the secretariat of the NZHF at IITA, explained that the peer advisory mechanism of the NZHF would encourage states to keep focus on the commitment they made towards agriculture so they could achieve their targets. 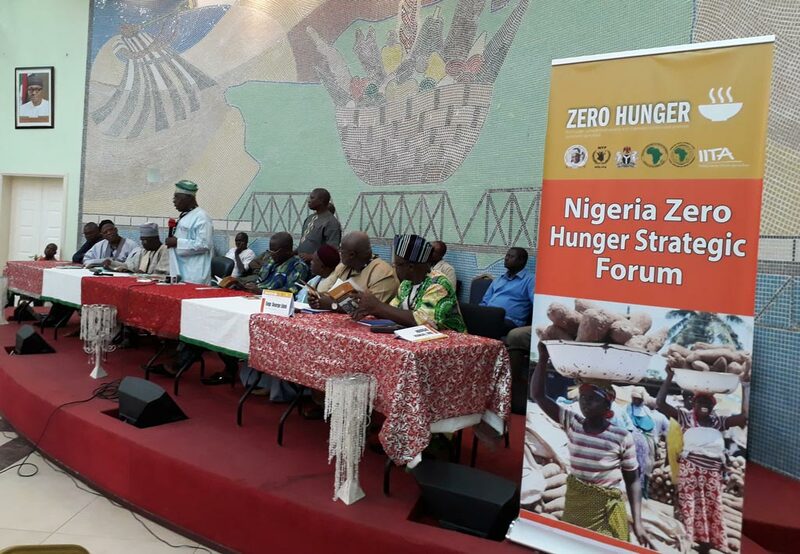 The Governor of Benue State, Samuel Ortom, described the Nigeria Zero Hunger initiative as a tool that would accelerate the agricultural development of states through peer learning. He noted that through the Forum the state was able to purchase fertilizers in good time for distribution to farmers. “Besides, through the meeting, we had been given advice on how to handle certain areas and in some cases the former president personally facilitated contacts on our behalf to persons who have the answers,” Ortom explained. The meeting in Benue, held 8-9 June, was attended by Governor Ortom, Ebonyi State Governor David Umahi, Deputy Governor of Borno State, and representatives of the governors of Ogun and Sokoto States, IITA, African Development Bank, World Food Program (WFP), private sector, farmer groups, members of Benue State Executive Council, Federal Ministry of Agriculture and Rural Development, Nigeria Army School of Military Engineering, and the press. The NZHF is supported by IITA, AfDB, WFP and the Olusegun Obasanjo Presidential Library.